The lack of sizeable rains for the past two weeks likely to end today, with copious rainfall activity expected to begin in the afternoon. Karnataka, Interior Andhra Pradesh and Tamil Nadu to witness widespread intermittent showers from today. North Eastern parts of India to receive scattered rainfall, whereas the western and central parts of India likely to remain dry. North interior and coastal Tamil Nadu to experience widespread thundershowers later in the afternoon or evening. 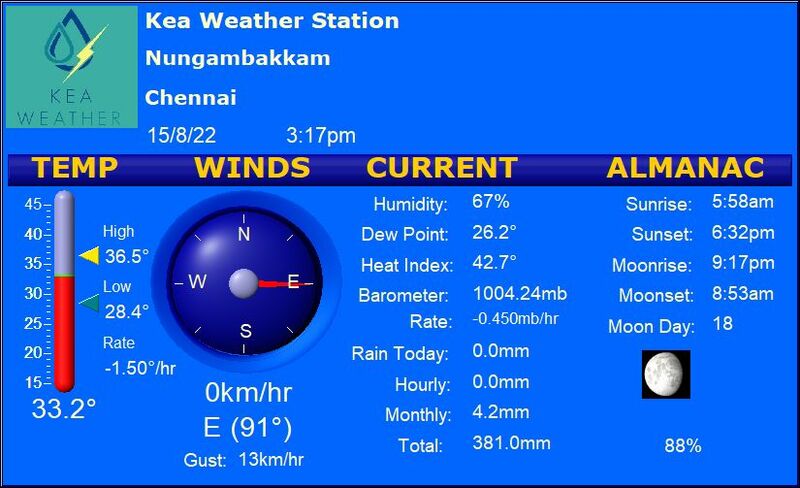 Chennai – A day with temperature touching 33/34C. Chances of thundershowers exist in the afternoon or evening. Vellore – A warm day of 34C with thunderstorms likely in the afternoon. Coimbatore – A mix of warm and cloudy day with temperature hovering around 32C accompanied by light rains. Trichy – A day of 35/36C with chances of thundershowers in the evening or night cannot be ruled out. Madurai – A day with temperature around 35/36C with possible rains in the evening.